Greetings Loyal Airmen, as most of you know, the Air Chief’s favorite movie of all time is the original, 1938 movie KING KONG. We saw at the age of 5 when it played in re-released in a local theater and it seared itself into our consciousness. Even at the age of 5, we somehow knew the giant gorilla really wasn’t a monster, but the actual victim and in the we didn’t want him to die atop that mighty Empire State Building. It wouldn’t be until years later that the movie’s moral theme became obvious to us as both an adult and adventure writer. Over the years we have seen the film well over a hundred times and we still love it. We have a deluxe-Blu-ray copy now and we also enjoyed Peter Jackson’s heartfelt remake, which comes in a second best. 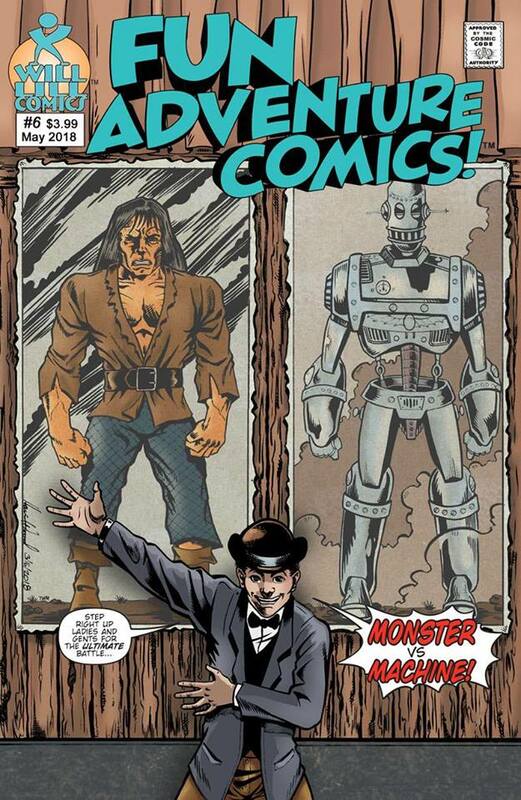 We do not even discuss the horrible 70s version with the guy in the gorilla suit. Please. So in last week’s Log Entry we told you all about our visit to a Muscle Car show. 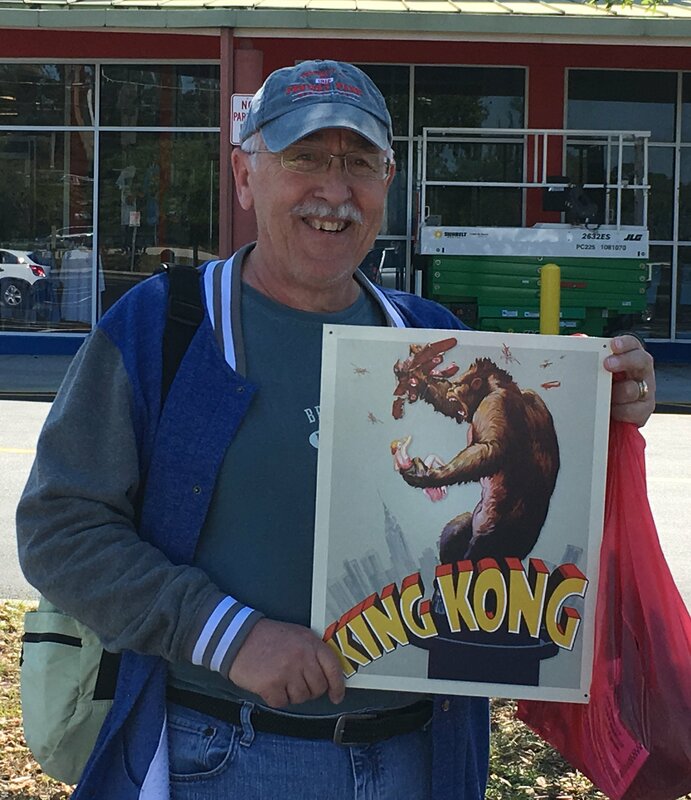 What we didn’t tell you was that in their gift shop were hundreds of tins…including just one of the King Kong movie poster. Yup!! And it now hangs on my office wall. Wahoo. 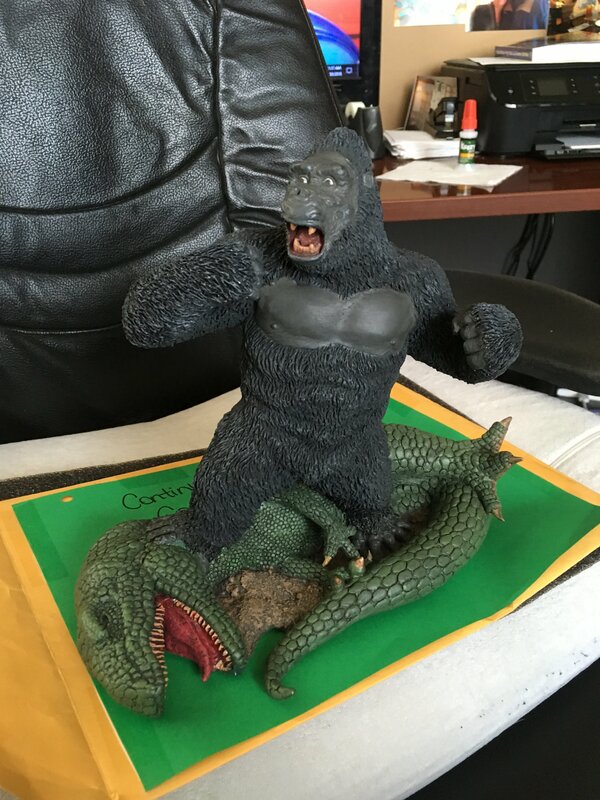 At the same the Air Chief found this tin treasure, we remembered that still left undone back in the office as a spectacular King Kong resin model kit given to us for Christmas by writer pal, Michael Housel. Ergo we vowed upon getting back home, we’d make time to put that model together. And today we did just that. Thankfully the kid itself came pre-painted and with only five pieces to glue together. Took us all of ten minutes to assemble, and yes, we should have done it months ago. Above is the finished kit, it highlights the scene from the original movie wherein Kong has bested a T-Rex in combat and is beating his chest in triumph. Thanks Michael, for a truly awesome piece which also gets a place of honor in the Air Chief’s inner sanctum. LONG LIVE KONG!!! One of the things the Air Chief loves to do is write short strips and then let his friends and colleagues have them for their own small independetn titles. 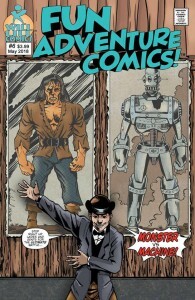 Such was the case several years ago when we penned, “Monster Vs Machine,” an eight page tale wherein Frankenstein’s Monster battles a steampunk robot. 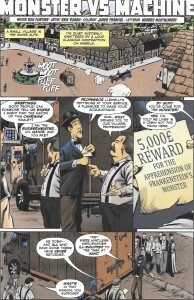 We were able to recruit super artist Erik Roman to draw the strip and our buddy WarrenMontgomery to letter it. It then appeared in issue # 5 of Redbud Studio’s RON FORTIER’S TALES OF THE MACABRE with a cover by Rob Davis. 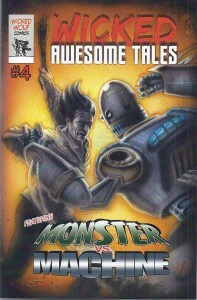 A few months later, Todd Jones, another pal, asked if he could use in his own black and white anthology, and it appeared WICKED AWESOME TALES # 4 with a cover by Jeff Herndon. Now that was well over a year ago. 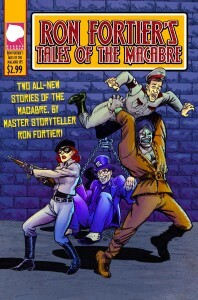 Now Warren, the same Warren who lettered the strip, is publishing it in the 6th issue of his own FUN ADVENTURE COMICS with a cover by Harrison Wood…and one major difference than the previous two printings, this one is in full color (see sample page #1 above) as rendered by colorist James Penafiel. Only goes to show you can’t keep a good strip down. 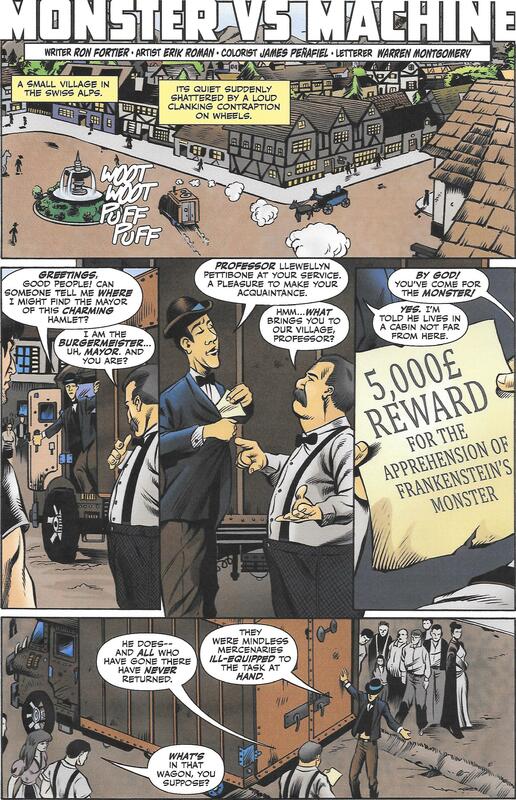 The idea behind all this exchange of strips between these small publications is simple enough, multiple publishing across the country expands the exposure of the strips and thereby the wonderful works of all the creators involved. The Air Chief plans on continuing writing and sharing these comic strips long into the future. We hope you enjoy them, whichever book you find them in. And there you have it for this week’s Flight Log, Loyal Airmen. Thanks for dropping and see you back here next Friday.